In the aftermath of the D-Day landings and the subsequent Allied advance across France, it seemed for a fleeting moment that the end of the war in Europe might be in sight. Instead, the Allies faced months of bitter fighting against a tenacious enemy. The bloody struggles of 1944-45 eventually ended in the final defeat of Nazi Germany. Following the liberation of Paris (25 August 1944), the Allied advance slowed as they re-grouped and re-supplied their forces. Although several of his commanders favoured their own army’s independent thrust into Germany, General Dwight Eisenhower, the Supreme Allied Commander, decided to advance to the River Rhine on a broad front. 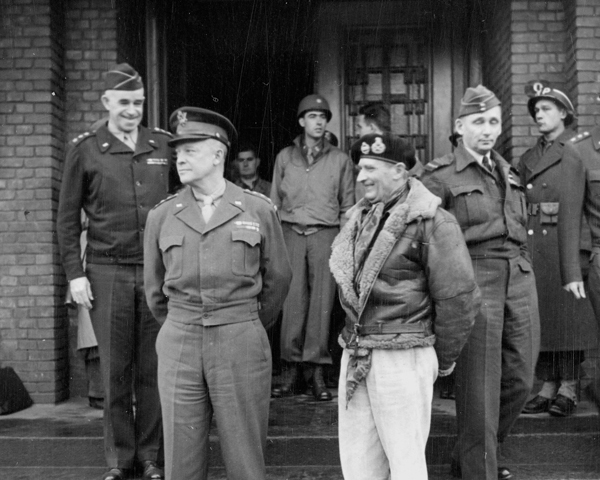 General Sir Bernard Montgomery’s 21st Army Group pushed on in the north, the US 12th Army Group commanded by General Omar Bradley in the centre, and the US 6th Army Group under Lieutenant General Jacob Devers in the south. The latter formation had landed in the south of France on 15 August. Since the Normandy break-out battles of the summer, the Allies had pushed on rapidly across France against a disorganised enemy, taking thousands of prisoners in the process. The slowdown of their advance allowed the Germans to stabilise their lines. 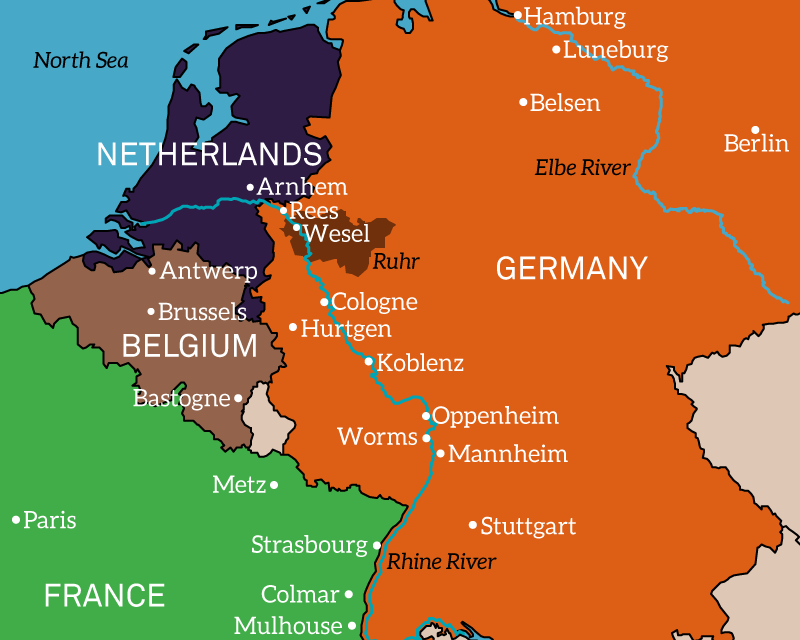 By September, the Allies were approaching the German border. 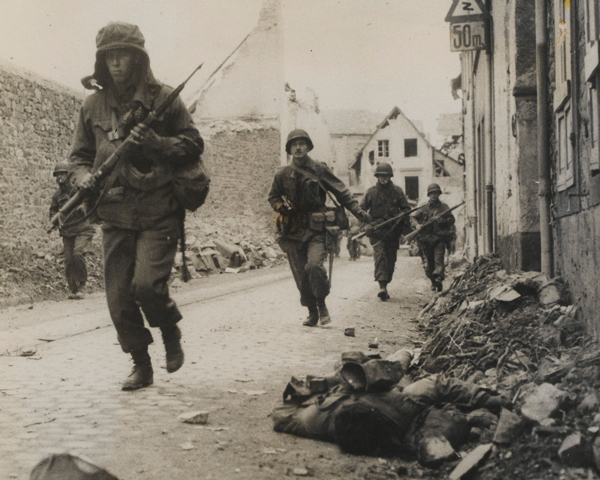 But their supply lines, stretching back to Normandy, were almost at breaking point. Afforded some breathing space, the Germans used this time to gather reinforcements and retreat to the Siegfried Line, a system of bunkers, minefields, tank traps and tunnels that ran from the Dutch border to Switzerland. Operation Market Garden - Montgomery’s daring airborne plan to outflank the Siegfried Line, cross the Rhine and advance into the Ruhr - had failed. 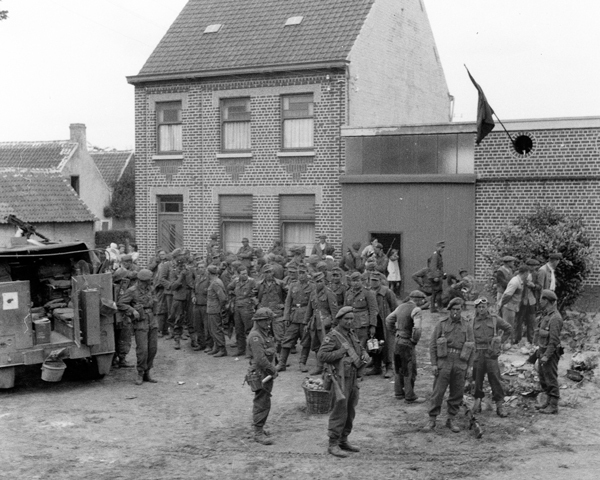 But by the end of September 1944, the Allies had successfully liberated large parts of France, Belgium and the Netherlands. And some British and American units were already on German soil. 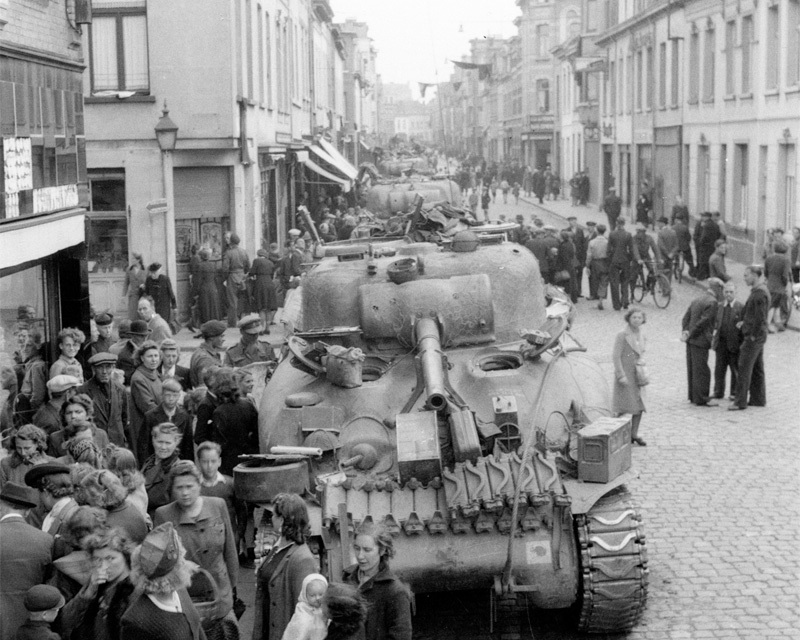 Following a rapid advance, the British 2nd Army had liberated Brussels and Antwerp on 3-4 September. Situated at the end of the Scheldt Estuary, the port of Antwerp could not be used until this waterway had been cleared of German defenders. 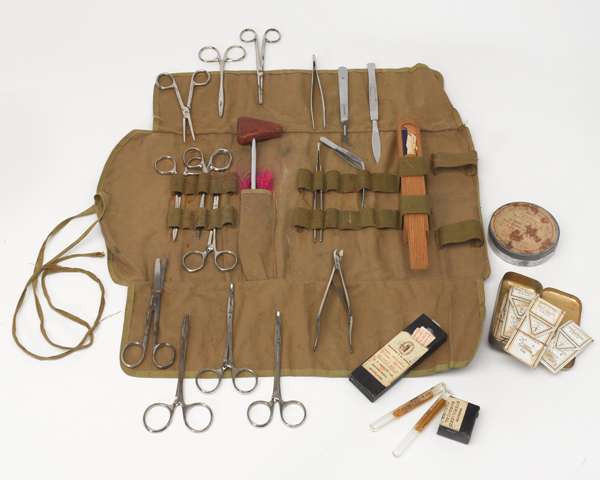 The operation to achieve this was delayed by the allocation of resources to Market Garden. It eventually began in early October. 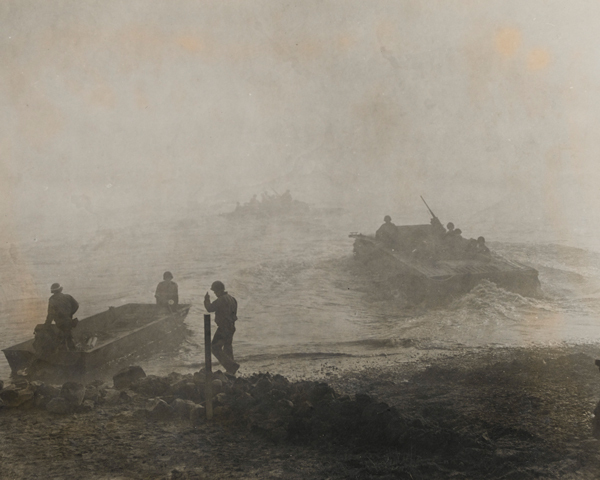 After five weeks of difficult fighting, including several amphibious assaults, the 1st Canadian Army, bolstered by attached units from several other nations, cleared both banks of the Scheldt for Allied shipping. At a cost of nearly 13,000 casualties, this victory transformed the logistics situation for the Allies, as Antwerp was much nearer to the front than their ports in France. Starting in mid-September, the Americans began fighting their way through the Siegfried Line during the Battle of Hürtgen Forest, which continued until February 1945. This attritional campaign cost the US 1st Army around 33,000 men killed and wounded. The Americans also captured Aachen on 21 October, after three weeks of fighting. It was the first German city to fall to the Allies. In the south, the American 3rd Army attempted to push the Germans out of Lorraine between September and mid-December 1944. 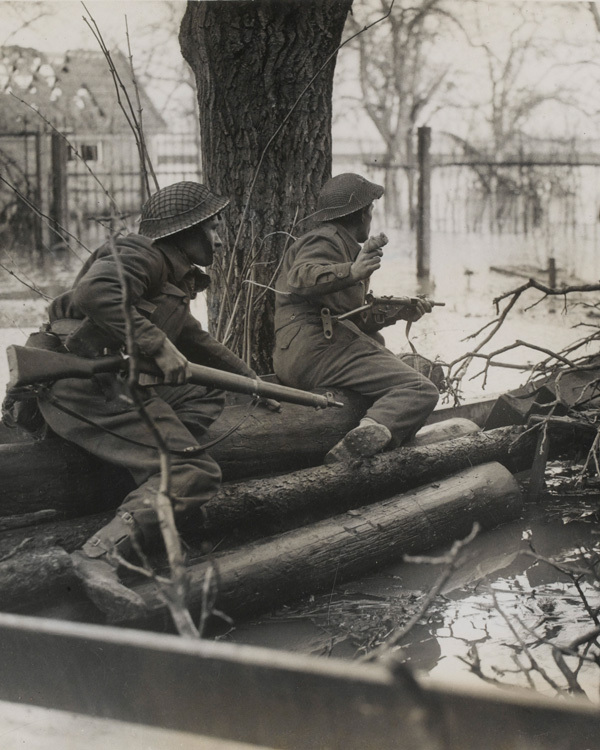 The crossing of the River Moselle and the capture of Metz proved difficult in the face of German reinforcements, supply shortages and bad weather. They eventually prevailed after suffering around 50,000 casualties. 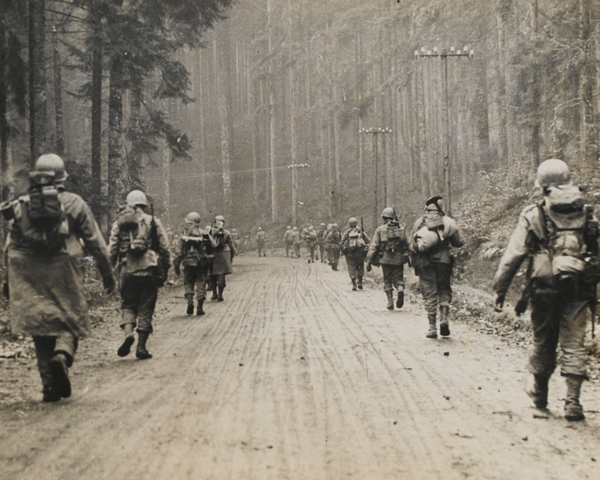 During September and October, the US 6th Army Group (consisting of the 1st French Army and the US 7th Army) also fought a difficult campaign through the High Vosges. The struggle here was marked by stiff German resistance and very slow attritional advances. 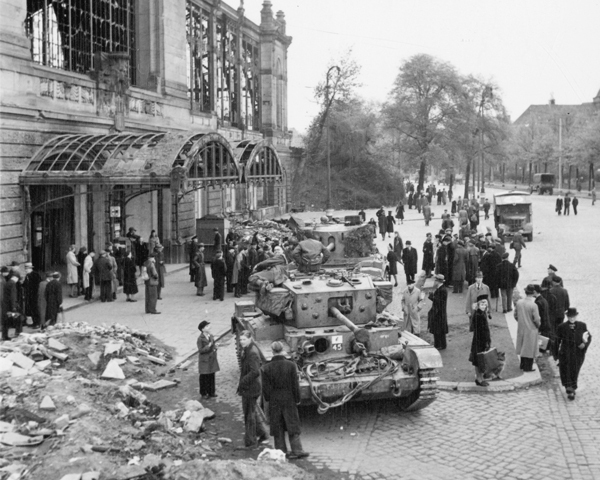 Nevertheless, the German front broke in November and Belfort, Mulhouse and Strasbourg were liberated. 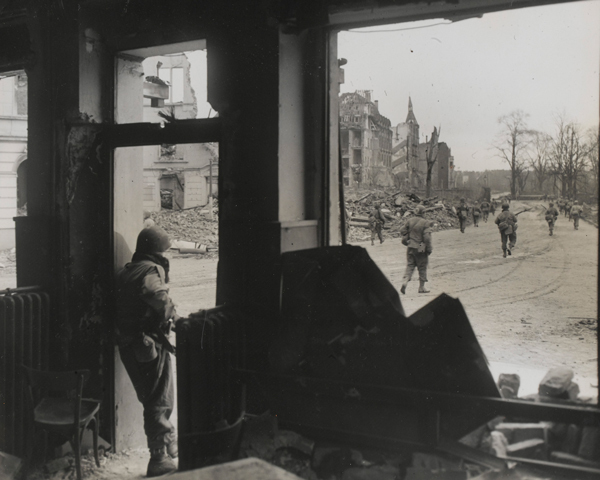 The Germans had meanwhile been preparing a counter-strike aimed at advancing through the Ardennes and swinging north to Antwerp, thus splitting the American and British armies. 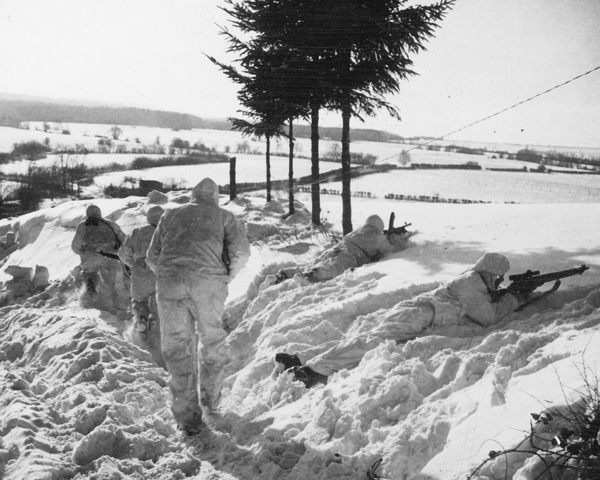 Their attack created the salient that gave the engagement its name, ‘the Battle of the Bulge’. On 16 December 1944, they assaulted a weak point in the Allied line guarded by four under-strength American divisions. Within five days, they had advanced over 80km (50 miles). They also benefited from the bad weather, which gave them cover from Allied aircraft. The Germans almost reached the River Meuse. But most American units stood their ground and managed to slow the offensive, eventually bringing it to a standstill. 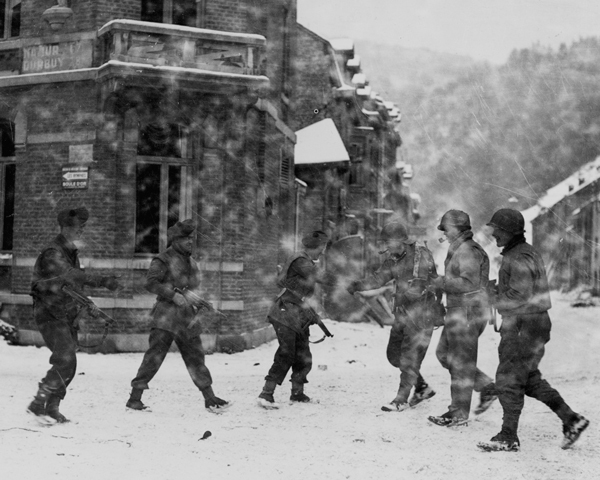 At Bastogne, the US 101st Airborne Division and several American armoured units were completely surrounded, but never surrendered. They held out until relieved by General George Patton's 3rd Army on 26 December. The Germans also outran their supply lines, and shortages of fuel and ammunition hampered their operations. 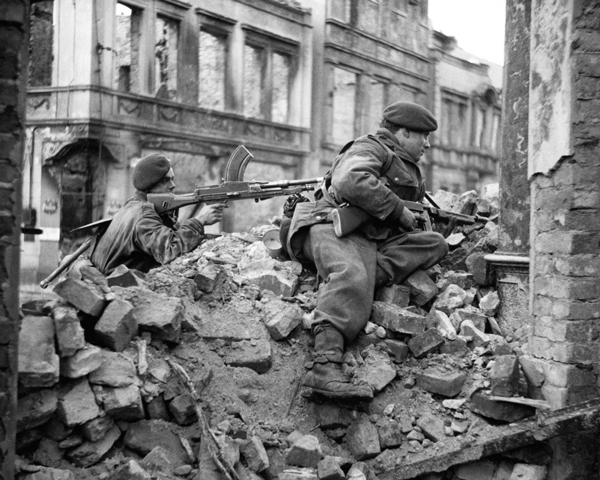 Few British troops were involved in the fighting, although Montgomery was given command of the northern sector and moved 30 Corps south to guard the Meuse. After halting the German offensive, the Allies now went on the counter-attack, hoping to trap the Germans in a pocket. Patton’s 3rd Army launched a thrust from the south on 30 December. Three days later, Montgomery attacked from the north and north-west, deploying the US 1st Army together with the British 30 Corps. Despite adverse weather conditions, the two Allied forces steadily closed the gap, meeting on 13 January 1945. Two days later, the Germans were back at their starting line. 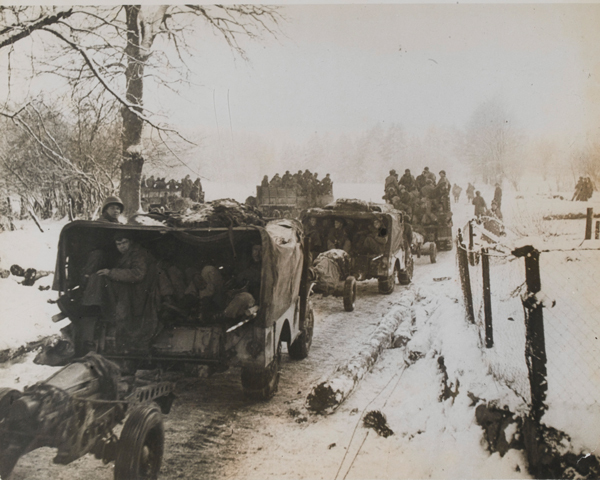 The Ardennes offensive had been broken, at a cost to the Germans of 120,000 men. The survivors retreated to the Siegfried Line. The Americans had lost over 85,000 men killed, captured or wounded. The Germans had launched another smaller offensive into Alsace on 31 December. 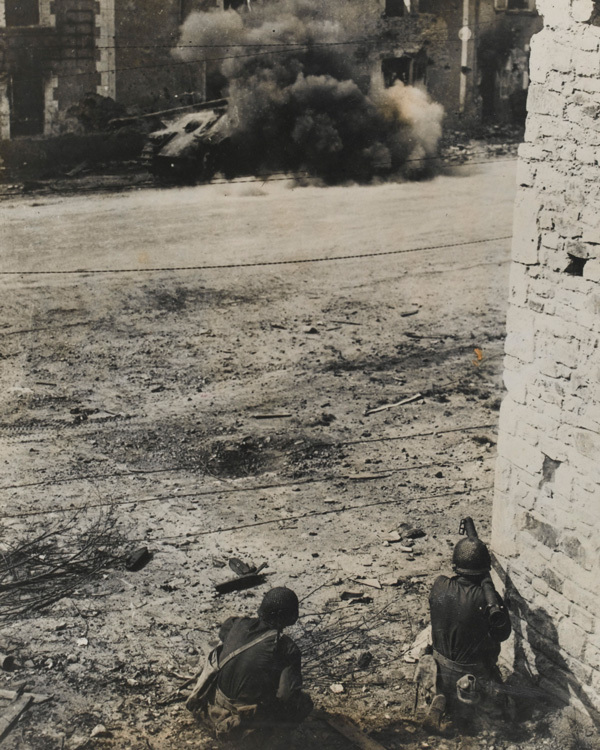 Aiming to recapture Strasbourg, they attacked the 6th Army Group. 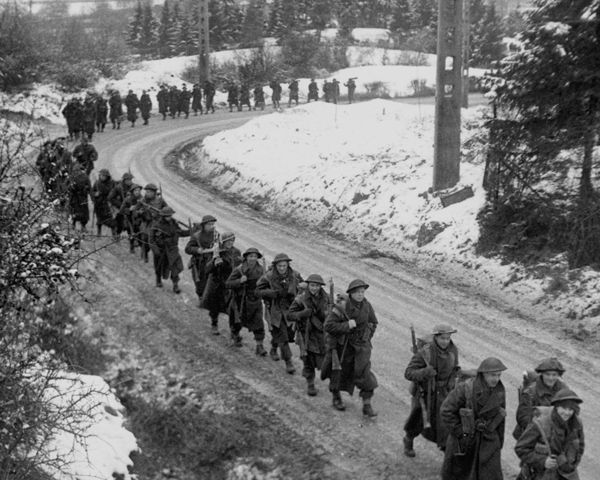 Although the Allied lines had become severely stretched in response to the Ardennes crisis, they resisted the attack. During four weeks of bitter fighting, they restored the front line and in the process reduced the Colmar Pocket, a German bridgehead on the western bank of the Rhine. Despite the failure of their winter offensives, the Germans continued to resist with great tenacity and skill as the Allies closed in on the Rhine during February and March 1945. The American armies broke through in several places. By early March, Patton’s 3rd Army had reached Koblenz and the 1st US Army, commanded by General Courtney Hodges, had entered Cologne. 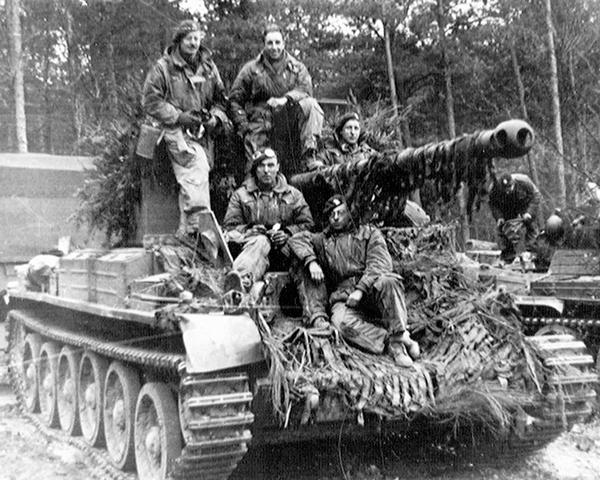 Some of the heaviest fighting during the advance to the Rhine was in the Reichswald, a forest west of Nijmegen between the Rivers Waal and Maas. The Germans had released the sluices on these rivers so that the areas north and south of the forest were flooded and impassable. The Reichswald itself had few roads and the Germans had built three defence lines. During Operation Veritable, 21st Army Group fought its way through difficult terrain in the Reichswald. It was not until early March that the entire area was cleared, at the cost of over 20,000 casualties. The advance on a broad front continued. 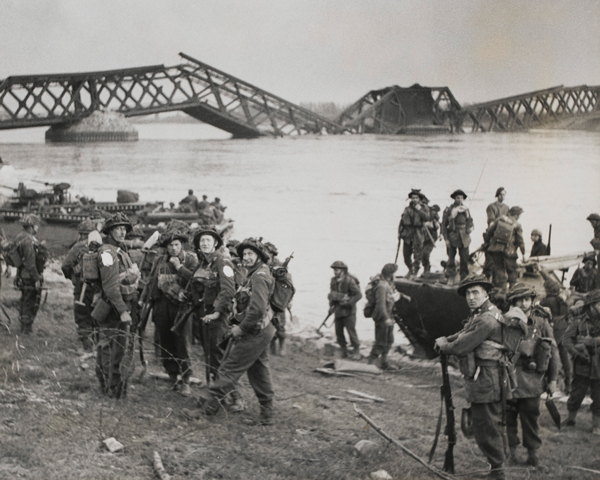 On 10 March, the Germans withdrew across the Rhine, destroying the remaining bridges as they retreated. 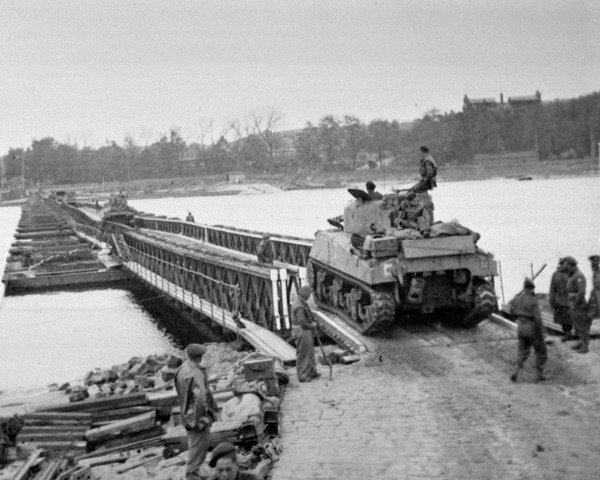 On 7 March, the 9th Armoured Division of the US 1st Army captured the partially damaged railway bridge at Remagen. 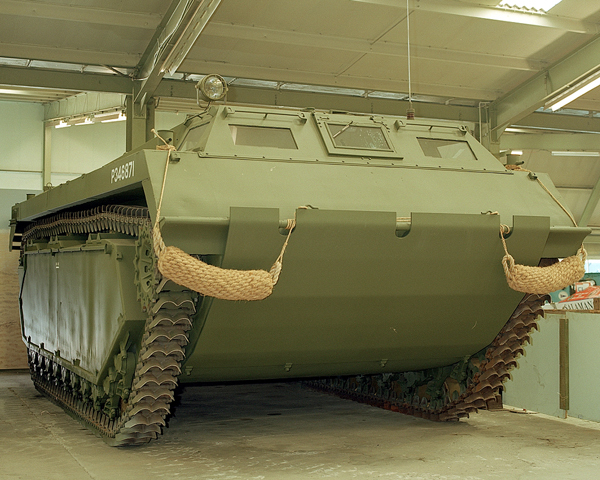 Bradley quickly exploited the opportunity and expanded the bridgehead into a full-scale crossing. 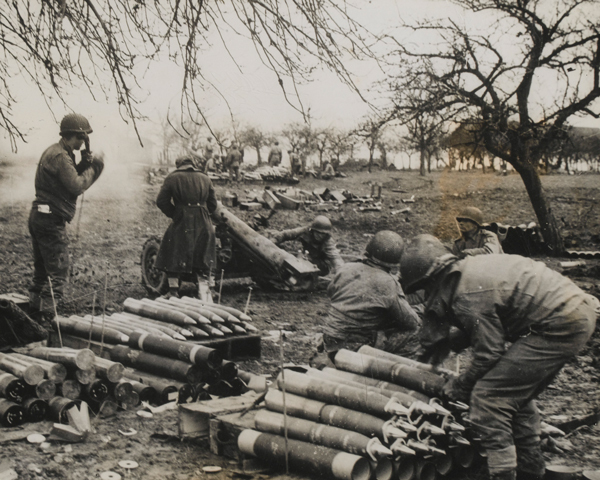 On 22 March, Patton’s 3rd Army crossed the Rhine south of Mainz at Oppenheim. On 23-24 March, elements of Montgomery’s 21st Army Group crossed at Rees and Wesel in a brilliantly executed assault. 21st Army Group’s amphibious assault was undertaken after a huge air and artillery bombardment and was hidden by a smoke screen. The British 6th Airborne Division and the US 17th Airborne Division were dropped by parachute and glider behind the German lines to secure a foothold and disrupt the defences. 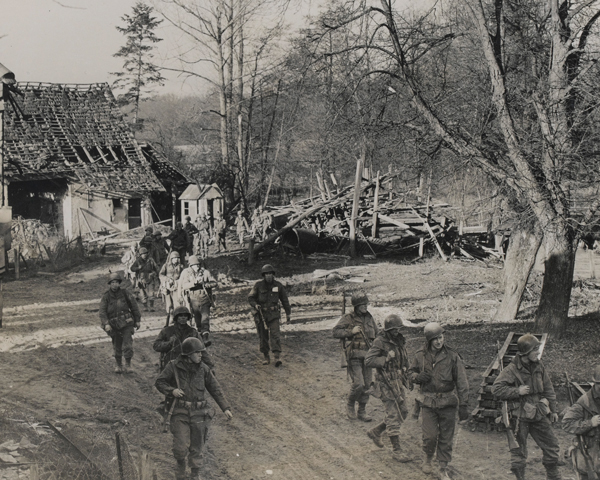 On 26 March, the US 6th Army Group also crossed in the area between Mannheim and Worms. Montgomery now hoped to lead his 21st Army Group in a thrust towards Berlin. Instead, the US 9th Army, attached to his Army Group since the Ardennes crisis, was ordered to assist in the encirclement of the Ruhr. This operation took over 300,000 prisoners. Meanwhile, the British 2nd Army advanced onto the North German Plain and the 1st Canadian Army wheeled left to liberate northern Holland. The British 2nd Army advanced towards Hamburg, crossing the River Elbe on 29 April 1945 and pushing on towards Denmark and the Baltic. On 30 April, as the Red Army closed in from the east, Hitler killed himself in his Berlin bunker. 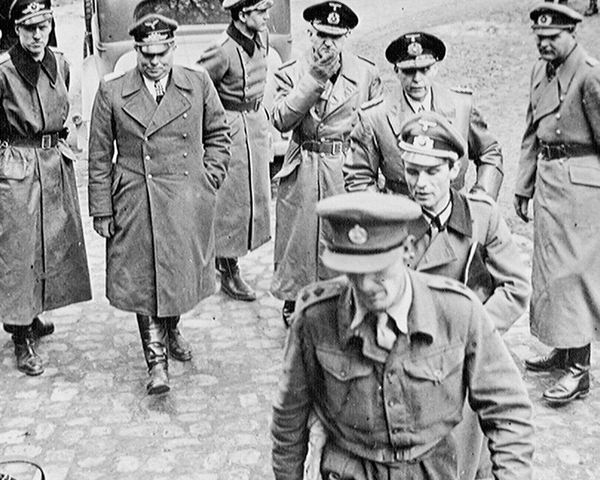 On 4 May, after weeks of fierce fighting, Montgomery received the surrender of the German forces opposing him at Luneberg Heath. Although the Red Army’s liberation of the concentration camps in Poland had revealed the Nazis’ crimes to the world, the full horror of the Holocaust was really brought to western public attention during Spring 1945, when the Allies liberated the camps in western Germany. On 15 April, the British 2nd Army reached Bergen-Belsen, near Hanover. Around 60,000 starving people, many suffering from typhus and dysentery, required immediate aid. Despite the best efforts of the medical services, hundreds died in the days after the liberation. 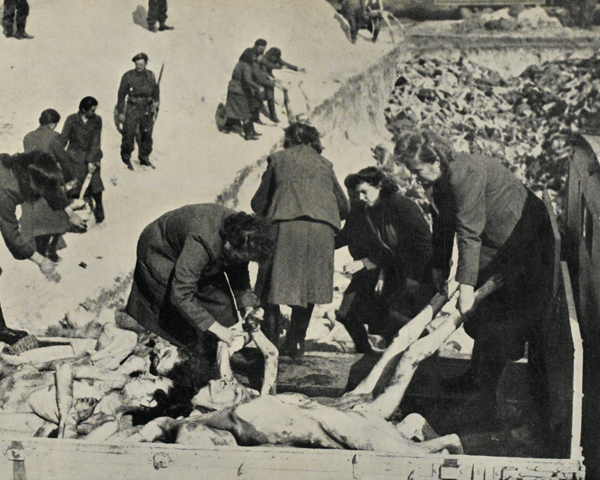 British troops made the SS guards collect the bodies of their victims and bury them in mass graves. German civilians living nearby were taken there to see what had gone on inside the camp in their name. An estimated 70,000 Jews, Slavs, political prisoners, homosexuals, Jehovah’s witnesses and criminals died at Belsen. Meanwhile, the Americans had raced the Red Army to Berlin. 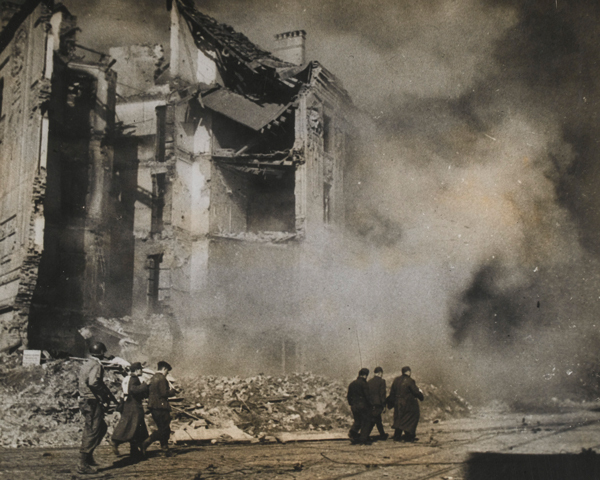 But the Russians made it there first, entering the German capital on 21 April 1945. The US 1st and 9th Armies then halted along the Rivers Elbe and Mulde, where they met the Soviets on 25 April. In the south, the US 6th Army Group advanced along the Swiss border, then through Bavaria, and eventually into western Austria, linking up with Allied forces coming up from Italy on 5 May. With Germany divided and in ruins, Hitler’s successor, Admiral Karl Döenitz, agreed to unconditional surrender on 7 May. Tuesday 8 May 1945 was declared 'Victory in Europe' (VE) Day, and marked the formal end of the European war. On 25 August 1945, 21st Army Group was renamed the British Army of the Rhine (BAOR). It was responsible for the occupation and administration of the British Zone of a divided Germany. However, as relations with the Soviet Union deteriorated, it eventually formed the core of the British forces responsible for the defence of West Germany during the Cold War (1945-89). D-Day enabled the Allies to establish a foothold on the beaches of Normandy. But they still faced the task of breaking out, pushing the Germans back and liberating France. In 1941 the Axis powers invaded Yugoslavia and Greece. British and Commonwealth intervention and evacuation followed before a vicious partisan conflict began.